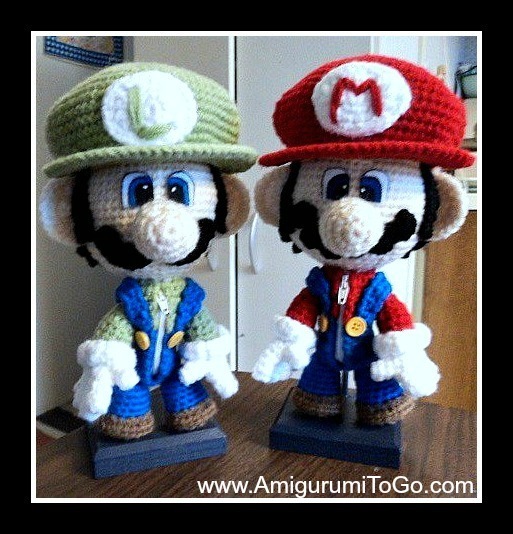 Mario and Luigi, oh my what memories! This pair I crocheted way back when I was just learning. I used a free pattern by the Golden JellyBean on youtube. At that time she had only Mario's pattern available so I just used different colors to make Luigi, he should be bigger and have a different mustache but hey, I was a newbie! But since then she has added Luigi's pattern as well. Here's a link to her site, just scroll through the photos and click on them to get to the patterns. She's got quite a few awesome gaming dolls available there so be sure to check them all out! I made these guys as a gift for my younger brother who I spent many hours playing Super Nintendo with... so many wonderful memories we share with the game. So when he opened his gift and saw these dolls he was really thrilled. I made them wooden stands too so they display nicely on his shelf. I was so proud of those dolls and my heart could have just burst with happiness that I was able to make them and get video help too! Thanks Nikki, you rock!! Colorado Territorial Prison offers a crochet class. Since YouTube is not an option, do you happen to have a set of written instructions for the Mario Brothers that I could print and mail? Games like the popular and addictive Candy Crush come up with new gaming concepts. Such games are slotted as needing "creative-oriented text."